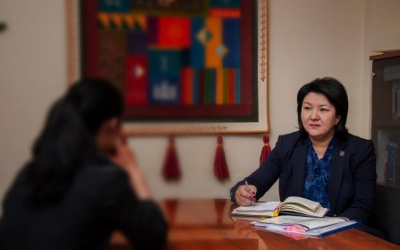 AKIPRESS.COM - Gulnara Sheishekeeva, defense lawyer, deputy chair of the Council of lawyers of the Bar of the Kyrgyz Republic, talked about Pro Bono Center in Kyrgyzstan and handled cases in an interview with Altynai Akmatova, PR and media specialist of the UNDP Project “Improved rule of law and access to justice for sustainable peace”. - Could you tell us please what is the Pro Bono Center? - Pro Bono Center is a good social project. Within the project we are able to provide free legal aid to vulnerable groups. At present not all defense lawyers are interested in free delivery of their services. Of course in the market conditions it is difficult to donate services – everyone has to earn his / her living, but from my experience I realized that doing business within the Pro Bono reminds us of a breath of fresh air, it is a pleasure when you see the results of your work, when a person in need of high-quality legal assistance after being consulted starts to believe in their own strength. Right now I am happy to be able to help a woman in depression. Now her eyes are shining and she is in a positive mood. Having provided such aid, I myself feel a surge of enthusiasm and energy in my daily work. - What case do you personally handle within the Pro Bono? - Now I consult a female resident of Bishkek, who asked to help her with her divorce from 15 years’ marriage. However, for 8 years she and her husband are living separately and do not have a common household. They have 3 minor children. Living together became impossible as her husband abandoned his family and became a follower of a non-traditional religious movement, regularly leaving for the so called "davaat". He constantly changed the place of his stay, has no job and does not take part in maintaining the family and upbringing of his children. The woman is highly worried that her husband might sell their house purchased in the marriage as he several times spoke about that saying that he would donate the money to the mosque leaving her and her three children on the street. As we all know, traditional Islam deplores such behavior of a married person especially when it negatively affects the financial situation of the family. - How did you meet each other? - Our meeting is an amazing story. I teach in one of Bishkek's universities, the subject being the profession of a defense lawyer. I prefer to keep the door to the lecture room open. During several lectures, I noticed a shadow behind the door and realized that someone was standing there. This happened several times. One day after class, when I was collecting equipment and books a young woman came to me and said: "I was looking for you." She maintains her children with 6 thousand soms’ salary of a cleaning lady. She said that for the sake of the family she also put on the hijab and went for "davaat", and left the children with relatives. However, her mother convinced her to return back to her children, as they remained without parental care for a long time. As soon as she realized that keeping the family was impossible, she started looking for a defense lawyer. "I'm looking for someone who I can trust. When I heard your lecture I decided to ask for help," she said. - Why did you decide to take the case? - You know, I saw that the person really needed help. During our first meeting she was under nervous stress, she was telling her story staring in one spot without raising her eyes. During our meetings I was telling her about her rights and that minor children can and must be assisted by their own father. Her complete trust in me touched me deeply. She has changed now – a totally different person comes to me. She is sure that there are people in this world who can help. Before the court hearings, we met again to discuss the position and our actions in court and suddenly she handed me a piece of paper from a notepad in an envelope with money. I felt a little hurt as people no longer believe that they can get qualified help free of charge. - What steps did you make to help this woman? - I studied the materials of the case, filed a petition of divorce and claimed alimony from her husband. The court honored the petition and accepted it for further proceedings, the first hearing of the case was scheduled for early February. The husband abstained from the sitting, he has not contacted his family for the last two years and seems not to be interested in children. My client is now living with their children in their home, which was bought during the marriage. Thank God, she has a title for the house therefore we decided not to claim for the division of property. If the husband were the owner, then we would have immediately requested the seizure of the house so that he could not sell or do something else with it. She is really worried that he can sell it, because he has repeatedly tried to convince her that one should get rid of all assets and live only the spiritual life. “I was told that he has been married five times and does everything according to religious rites “nikah” and “talaq”, another woman simply leaves as the official marriage is with me only,” my client said. I will continue the representation of my client’s interests in court, the hearing is scheduled for March. - How do you think you will help your client? - I think that I have already did it, as she is a person with a higher education, a teacher in the elementary school, but after her marriage her self-esteem greatly decreased. Now she with confidence says that she decided to change the job. She took out her diploma and this is my victory. You know, she is a perfect mother, she is pleased to show pictures of her children, their own drawings and describes their achievements. Now she believes that the law is in place and that assistance can be provided even if one cannot afford a paid lawyer. The last time she came she looked totally different. Her eyes are now shining. - You work Pro bono which means that you do not derive any money from the case. What are the benefits for a defense lawyer in occasionally handling cases free of charge? - First, I realized that I helped someone and this is for my own spiritual satisfaction. Some of the thinkers said that the being a defense lawyer is to serve the people and I think that this is true. The second reason is that I want to show by my own example that there are decent lawyers who can enjoy trust. What we have to do is raise the profile of our profession. There is a need to prove that the defense lawyers do not only take money, but they also work for the benefit of citizens. I cannot claim to be practising lawyer, I am rather a theoretician with not many clients, but I think that free legal aid should not differ from the paid one, it requires even more efforts.